Does ASTM F1554 require headed anchor bolts to be stamped on the head with the fastener’s grade symbol and manufacturer’s logo? Stamping the heads of F1554 anchor bolts is not required per the ASTM Specification, but Portland Bolt chooses to do so to provide a secondary identification. ASTM F1554 anchor bolts are marked on the threaded end that projects from the concrete with a designating color code, as is required by the specification. Marking the threaded end that protrudes from the concrete with paint allows engineers and inspectors to identify the grade of anchor bolt that is embedded in the foundation. 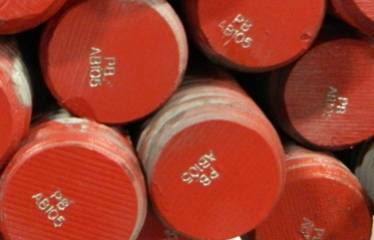 F1554 has two supplementary requirements that allow for permanent marking on the projecting ends of anchor bolts. Supplement S2 requires marking the manufacturer’s identification and Supplement S3 requires marking the grade identification. When permanent manufacturer’s identification or permanent grade identification, or both, are required, Supplementary Requirements S2 or S3, or both, shall be specified on the inquiry and purchase order. When Supplementary Requirement S3 of F1554 is specified, it is not required to paint the projecting threads their designating color, although Portland Bolt chooses to paint the projecting threads even when S3 is specified. 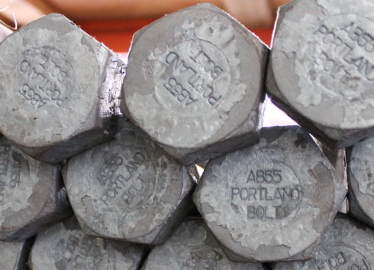 While permanently stamping the headed end of F1554 anchor bolts is not required or detailed in the ASTM specification, Portland Bolt chooses to stamp the headed F1554 anchor bolts that we produce in order to provide an alternative way to identify the bolts before the headed end is embedded in concrete. Is color coding required on F1554 anchor bolts when supplemental requirement S3 is requested?